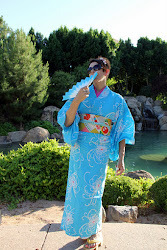 I'm going to be teaching a very basic yukata kitsuke (dressing) workshop in a couple of weeks. I have eight yukata and about 12 hanhaba obi that I will be loaning people for the workshop. However, I only have eight koshihimo, not enough for everyone to have two. For newbies, a koshihimo is an essential accessory in yukata and kimono kitsuke. 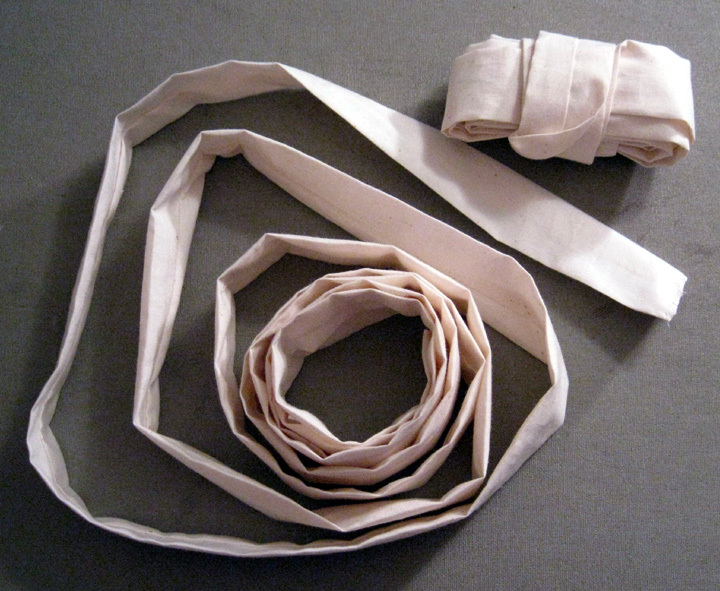 It is the "string belt" that you use to fasten all of the the garments closed, including juban. They are not seen once the obi is tied. For yukata, woman require two and men's yukata need one in order to dress properly, not including the juban. Since they can be pricey to buy a large quantity at once, I decided to make my own. I looked at my existing koshihimo and used them as a guide for a basic pattern. 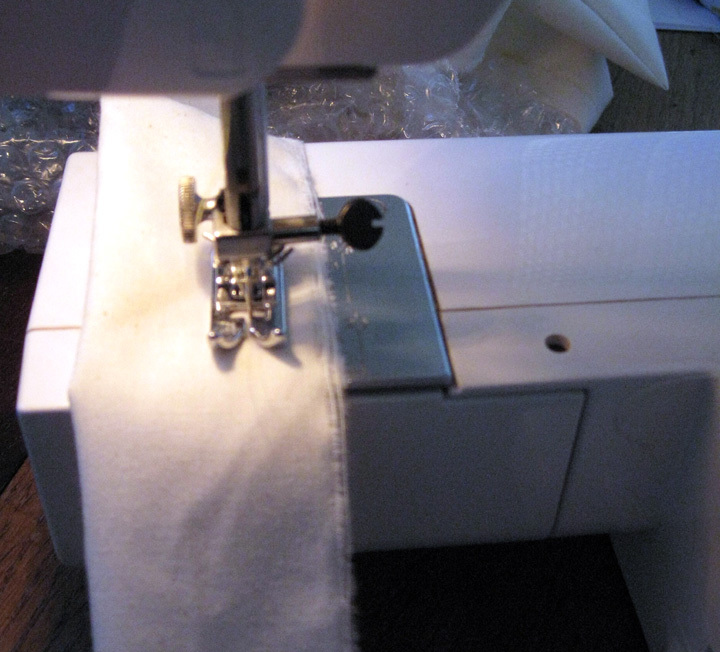 If you have a sewing machine, these are very easy to make and you can make several in an afternoon. I bought three yards of unbleached, permanent-press cotton muslin, 45" wide at about $3.89 a yard. Muslin is inexpensive and has a slight texture to it and is easily washable. It doesn't have to be permanent press, but I though it would save some ironing time after washing. You can also easily dye muslin if you are feeling extra industrious. If you make them out of satin or other slick material, they won't grip very well, so I recommend a very lightweight fabric with a bit of texture. Here is what I did: I cut each strip 3.75" wide and made most of them 84" inches long (The length of most of my koshihimo from Japan) and three of them 108" or three yards long. These will be used for larger people. I ended up with twelve total and they turned out well. If you are a beginning sewer, here are the steps to make them and a few photos. Mark fabric with a pencil in 3-3/4" intervals; marks should be parallel to the selvedges or finished edges of fabric length. Start cutting in a few inches and tear the rest. The strip will tear perfectly straight if you use muslin. 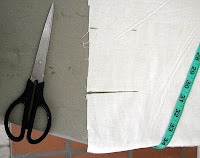 Fold over your strips and sew a straight seam 5/8" inch (average seam allowance) from the edge. No need to pin the strips so they stay closed. You now have a tube open on both ends. (Or sew one end closed on the machine. Either way will work). Turn your tubes inside-out. There are several ways to do this and no need to buy special tools; I just use a big safety pin. Here is how-to video. Hand stitch the end closed, folding in about 1/4" of the fabric so you don't have those unraveling treads constantly coming out. Muslin unravels like crazy! I used unbleached muslin, a lightweight plain cotton fabric that is inexpensive. A cotton bed sheet would also work, just cut it up!